Making herbal extracts at home is very rewarding. You get the benefit of knowing what’s in the extracts you made and how to make it yourself. When people make concentrates at home, they usually opt for the safe, chemical-free version called rosin. Rosin is made by placing a bud in a piece of parchment paper and pressing it between an even heat source. Too much heat and you will cook of valuable terpenes. Not enough heat and you will lose yield tremendously. Rosin is a solventless extraction method that uses pressure and heat to extract cannabinoids from cannabis. Rosin has grown exponentially in popularity because it doesn’t require extensive knowledge or understanding of botanical extractions or chemistry. What this means is that just about anyone can make quality rosin with the right press and a little bit of tinkering. If you’re tired of struggling with a flat iron for hair styling and some clamps to make the concentrates you want, here are some great options. We’re going to start at the top of the list with the most expensive and work our way down. Remember just because something costs more doesn’t mean that it’s necessarily better. To get to the pressing issue at hand let’s take a look at rosin press number one. The eGLOW 8000 PSI Professional Rosin Press- coming in priced around $1,000, this rosin press is top of the line if you have the money to spend. The eGLOW is a pneumatic rosin press with dual 8 x 6 heating plates. This press is capable of producing 8000 PSI. A full digital display allows for easy setting of pressure level, temperature, and time. Experimenting by fluctuating and altering times and temperatures along with pressure can yield you with the perfect rosin. 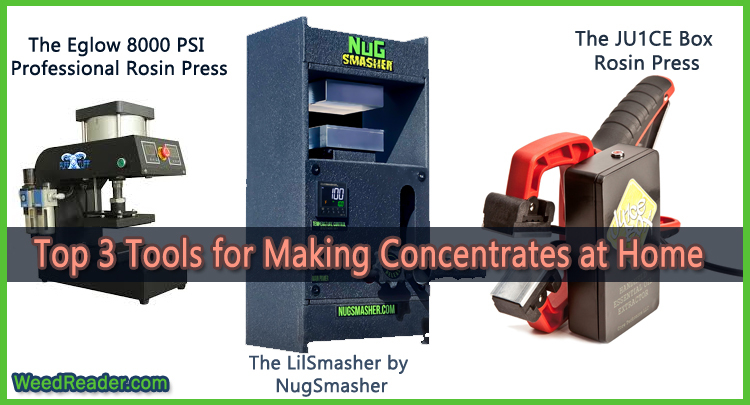 The LilSmasher by NugSmasher offers up 6500 PSI and is constructed from solid steel. Dual plates at 3 and 1/2 by 4 inches make for easy pressing with the attached 300w dual heating elements. Get ready for a little bit of a workout to make this rosin. If you have arthritis or weak muscles, this may not be the machine for you as the pressure is applied manually by a lever on the front of the LilSmasher by NugSmasher. This lil’ unit will set you back a lil’ coming in at around $800. The JU1CE Box Rosin Press is the ideal little device for a single individual looking to make a few dabs here and there for their personal enjoyment. This small rosin press has a 1 inch by 1 and 1/2 inch plates with dual heating elements. This makes this small device perfect for 1-3 gram presses. If you’re looking for the flat iron taken to the next level, this is it. Coming in at $124.99 the JU1CE Box rosin press has everything you need to start making rosin right away, except for the nug. Do you have a preferred rosin press for making rosin at home? If so, let us know in the comments below! We love to learn about new and exciting products for cannabis consumers!